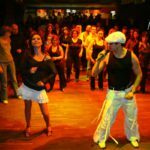 (česká verze) Not sure if you are interested in dancing salsa? Would you like to try it first? We offer salsa class open to everybody from absolute beginners to those who just would like to check our style. The open class takes place in the center of Prague every Tuesday evening at 8pm. On this open dance lesson we teach salsa from very first steps. How does it work? We will explain the basics understandably that simply everybody can get it. We will explain music structure, how to follow rhythm, basic step patterns and some simple figures you can dance immediately in the club. We teach Puerto Rican Style aka Salsa Linea or Cross Body Style Salsa, which is the most important and most widely spread salsa style worldwide. Who is the lesson for? The lesson is literally for everybody but is ideal for newcomers in couples, solo or groups. If you plan to join us in bigger group (10+), let as know in advance please. Who is teaching? Your salsa teacher Honza from Bohemian Salseros dance school is doing this salsa open classes for over 15 years. He teaches simultaneously in Czech and English. His funny approach will makes you laugh but also brings knowledge and skill into your dancing. You will definitely enjoy it. So do not hesitate and join us on Tuesday!